We will go back to Nuuksio but this time with snowshoes. 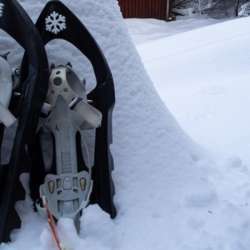 Natura Viva has a convenient self-service to rent snow-shoes directly in Haukkalampi. The same spot where we met last time. We will snowshoe around and on our way will stop at one of the grilling areas. Choose bigger or smaller ones. Choose hourly based option. it is 25€/ 12 h.
You will then receive a PIN code that you can use to open the door. It is self-service based. Note that you cannot reserve them at place as they fill the storage based on reservations. - Bring hot drinks in thermos like tea, hot chocolate, coffee etc. - And anything you want to grill or warm up like sausages, cheese, sandwich etc. We expect you to be there by 10:45. To get the gear and get ready to move by 11:00. We should be finished latest by 15:00.